The Fourth of July has always been one of my favorite holidays. I love this day because everyone is so patriotic and festive, we always spend it with friends and family and we eat lots of good food! If you’re anything like me, when it comes to the holidays, I am always looking for recipes that I can serve to everyone that are not only delicious, but festive as well. But, with an on-the-go toddler, I don’t have time to spend the entire day in the kitchen cooking. So I find recipes that are easy, quick and something the whole family will love. Who’s with me here?! 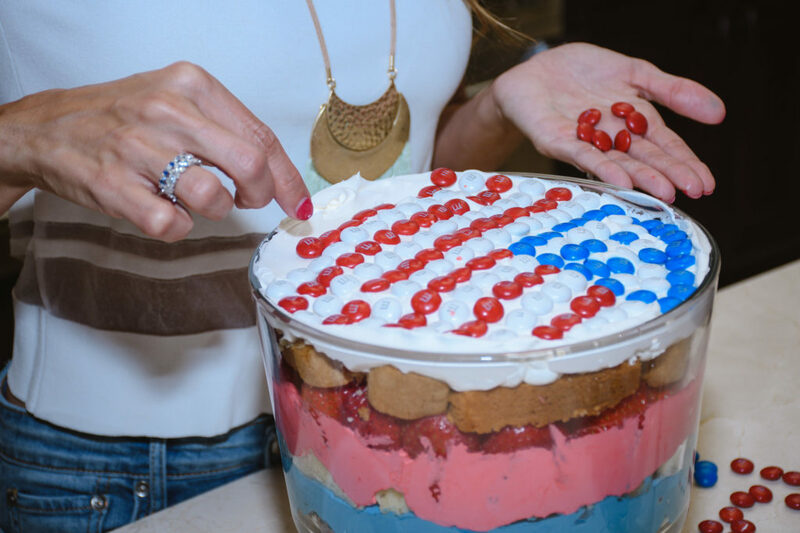 I’ve teamed up with Mars to create this festive and oh-so-easy All-American Trifle with Red, White & Blue M&Ms! 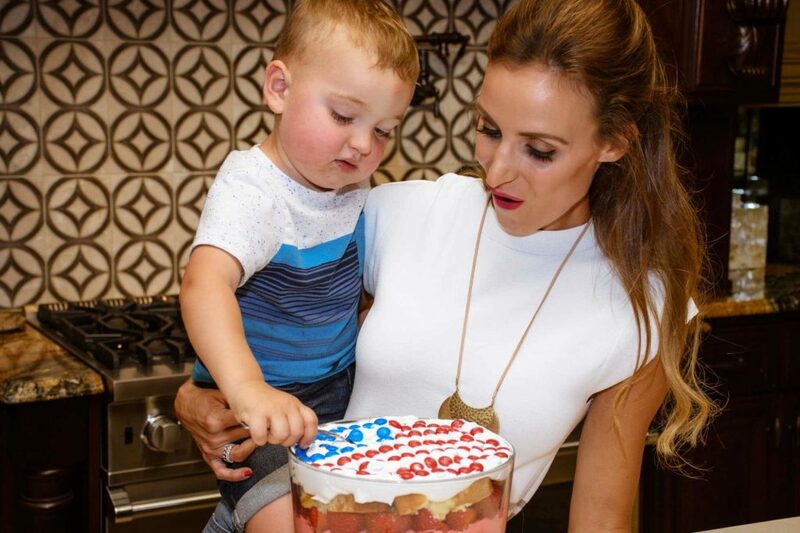 This is the perfect recipe for any busy moms out there because it uses pre-made pound cake and it’s no bake! And it turns out so pretty that your guests will definitely be impressed by your skills in the kitchen! Prep by dying 1 tub of whipped topping red and 1 tub blue. I used the whole small squeeze bottle of each color otherwise it looked like a pink and blue gender reveal dessert (LOL!). Trim and slice the strawberries in half. Tear apart the pound cake and make a bottom layer in your trifle of pound cake. I personally like putting the outside of the pound cake around the outside because it looks cleaner but that’s just my OCD talking! Spread the blue whipped topping over the pound cake and sprinkle blue berries. Then add another layer of pound cake followed by the red whipped topping. I lined this layer with the strawberries around the edge, with the outside of the strawberries facing the outside of the trifle. Then I filled the center with strawberries. Then one more layer of pound cake and for the last layer you spread the white whipped topping. 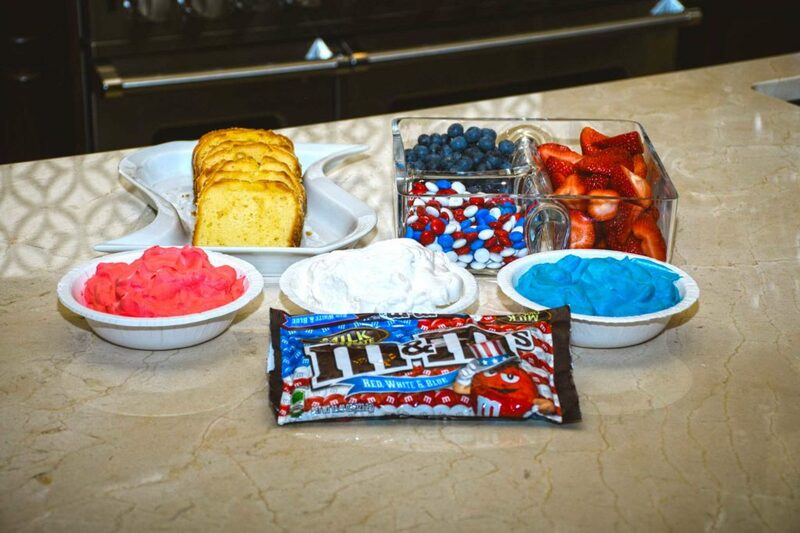 To top off the dessert, I made an American Flag out of the Red, White and Blue M&M’s. This is the fun part but it also takes the most time (maybe more time for me because I wanted all the M’s face up and in line on the M&M’s!). But it’s worth it because the whole recipe takes just about 15 minutes to make! 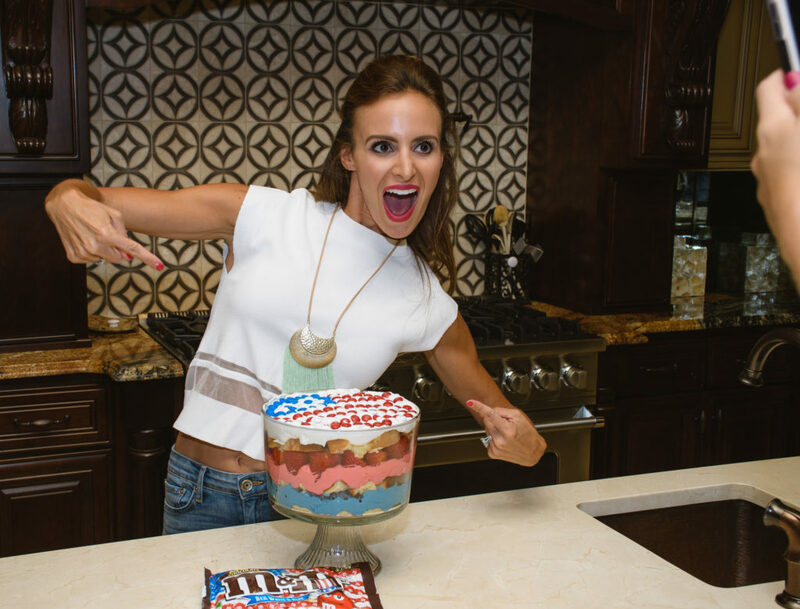 You could also get creative and make a star or fireworks, or really anything out of the M&M’s! Chill the trifle until ready to serve. And be sure to take lots of pics before everyone digs in! I love this recipe because it’s easy and fun to make, it serves a lot of people, it’s festive and it is SO GOOD! Don’t forget to go to www.SweetShowofSupport.com to send a thank you card to our troops! For every card shared, M&M’s will donate a bag of M&M’s to Operation Gratitude for care packages for the troops. Fun fact: Did you know that M&M’s were created in 1941 specifically for members of the U.S. military? The candy shells prevented melting, making them the perfect treat for soldiers. I hope everyone has a safe and fun 4th of July and please take a moment to thank our troops!